French toast, also known as the ‘eggy bread’ and ‘gypsy toast’ is a dish of bread soaked in beaten eggs and then fried. It is a twist version of normal french toast. The taste of banana after toasting...mmm sure tasty. If you try this dish, you will be tempted to make this dish the following day as well. Days when you feel lazy, this is the one dish you must try. Kids would love it too. In a broad bowl take the banana pieces and mash it well with the backside of a spoon. Crack the egg and add sugar and beat well. Then add the milk, cinnamon and beat well. Heat the nonstick pan and add 1tsp of butter and keep the flame to low to medium. 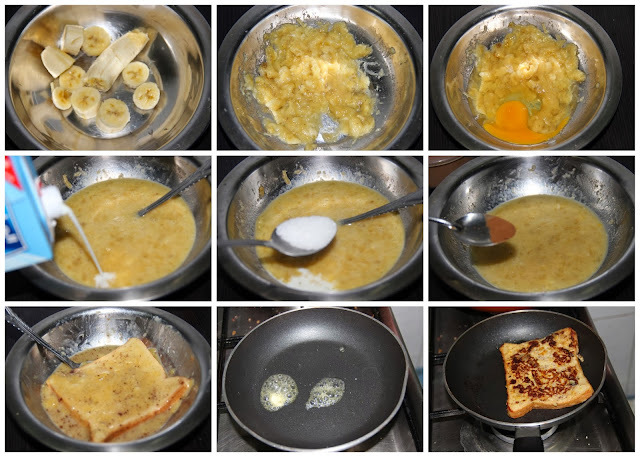 Keep the banana egg-coated bread slice on and toast on both sides till golden brown and well cooked through. You could top the cooked slices with jam, marmalade, butter, honey, maple syrup, golden syrup, fruit flavored syrup, molasses, apple sauce,whipped cream, fruit, chocolate, Nutella, sugar, yogurt, powdered sugar, ice cream, various nuts, or other similar toppings. adding banana is something new to me..interesting yummy recipe..